This unique wardrobe was designed and executed by Hildo Krop for his own home around 1930. 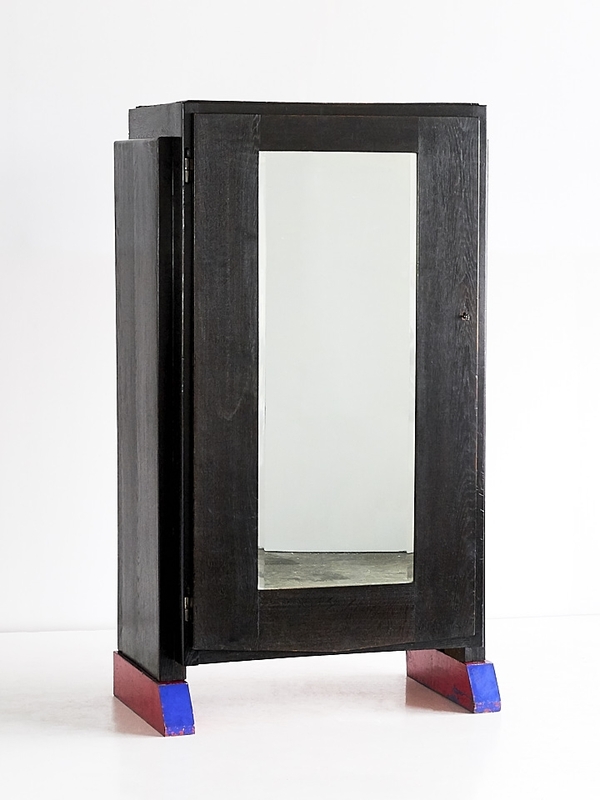 The large cabinet is made of black stained oak, lacquered red and blue oak legs, a mirror door and the original key. The cabinet was made by Krop in his own workshop and has always remained in the Krop family by descent. In 1963 Krop gifted the cabinet to his son Johan, who in turn l gifted it to his own son Hildo (named after his grandfather) later. A signed provenance certificate from Krop’s grandson is available. Interestingly, the design consitutes a break with Krop’s usual style which was deeply rooted in the expressive and dramatic Amsterdam School style. In its modernist reduction to the essentials of form and colour, the use of unadorned stained oak wood and the primary colors of the legs display a striking similarity to the abstraction proposed by the artists of De Stijl such as Gerrit Rietveld and Theo Van Doesburgh. Hildebrand Lucien (Hildo) Krop (1884-1970) was a prolific Dutch sculptor and furniture designer, widely known as the city sculptor of Amsterdam, where his work can still be seen, among others, on interbellum buildings and bridges. Several of his furniture designs now belong to museum collections, including the Amsterdam Rijksmuseum and Stedelijk Museum and the Gemeentemuseum in The Hague.